Trevally is caught around the North Island and the north of the South Island, with the main catches from the northern coasts of the North Island. Trevally is taken in the northern coastal mixed trawl fishery, mostly in conjunction with snapper. Since the mid-1970s trevally has been taken by purse seine, mainly in the Bay of Plenty, in variable but often substantial quantities. Recreational fishers catch trevally by set net and line methods. Although highly regarded as a table fish, some trevally may be used as bait. Trevally is managed by the Ministry for Primary Industries using the Quota Management System (QMS). 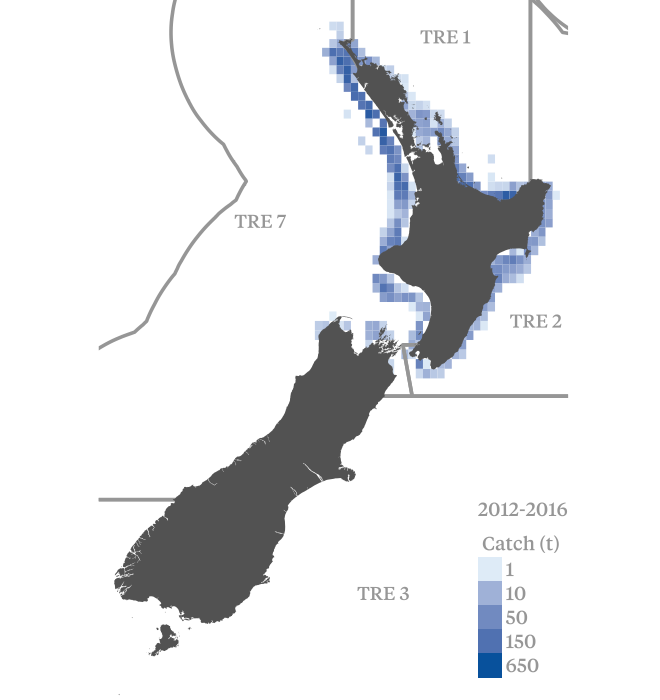 The risk assessment covers over 80% of all trevally caught commercially in New Zealand. TRE 1 is believed to contain two biological stocks: East Northland to Hauraki Gulf, and Bay of Plenty. Stock assessments for each of these stocks were rejected by the Northern Inshore Working Group in 2015 and 2016. These assessments have not been finalised and will be updated once the new catch-at-age data become available. Relative abundance series were increasing for both Bay of Plenty and East Northland/Hauraki Gulf. The Ministry stock status table does not draw a conclusion about the status of the stock in relation to reference points. The TRE 7 stock was most recently assessed in 2015 using an age structured population model. The Ministry concluded that it is very likely (>90%) the stock is at or above the target reference point. Accordingly, there is strong evidence the stock is highly likely to be above the point of recruitment impairment and fluctuating at or around a level consistent with maximum sustainable yield. Between 2002–03 and 2014–15, there were no observed captures of any birds, pinnipeds or dolphins in minor purse seine fisheries. Target species (TRE 1) - Improving: Relative abundance series were increasing for both areas. New stock assessments are expected to be completed once new catch-at-age data become available. Target species (TRE 7) - Stable: The stock is above the target reference point and fishing mortality is lower than the rate that, if applied constantly, would result in maximum sustainable yield. Target species (TRE 1_PS) - Stable: Although variable, recent levels of fishing intensity have been at or around the rate that, if applied constantly, would result in maximum sustainable yield. Bycatch and ecosystems (TRE 1_Trawl & TRE 7_Trawl) - Improving: The information base to examine the ecosystem impacts of inshore trawling is growing. The introduction of electronic monitoring on at least some inshore fleets should improve understanding of catch composition and allow more sophisticated assessments of the impact of the fishery on non-target species. ETP species risk assessments have been continuously refined over recent years, resulting in reductions in estimated risks from inshore trawling. Habitat research is ongoing with new studies planned to better understand the dynamics around impact and recovery. Ecosystem modelling is also underway to better understand the trophic impacts of inshore fishing. Bycatch and ecosystems (TRE 1_PS) - Stable: Additional work to understand the status of bycatch species may reduce the other species risk score.